Wondering about the recent barrage of bento posts? Simple explanation—Iâ€™m flat broke! So to make sure Iâ€™ve something to eat, I resolved to prepare bento on a daily basis. Itâ€™s not costing me anything since I have a freezer-full of food that I bought earlier, when I had money. So to naysayers who think that preparing bento is expensive, trust me, itâ€™s not. Well, unless you feel like you have to buy various boxes and accessories, or insist on wagyu beef for your gyu asupara maki, but really, itâ€™s only as pricey as you let it be. One of my freezer staples is homemade frozen Tonkatsu. Essentially a breaded porkchop, what differentiates it from porkchops from other countries is the use of panko , flaky Japanese breadcrumbs. It’s really a simple affair, just dredge your meat in flour, scrambled egg, then panko. Freeze or fry, as you like. To save space, I laid the sliced tonkatsu (sliced for easier handling with chopsticks) on freshly steamed rice, and garnished that tier with sliced Naruto Kamaboko , a Japanese minced fish food item sold in long cylinders. It may sound icky but just think of them as fishballs in a more decorative form. On the top tier, I sliced half an orange (half of yesterday’s) into wedges. I also added some sakura (cherry blossom) shaped cucumber slices—mostly to up my vegetable intake—and a Hello Kitty sauce cup of store bought tonkatsu sauce . Quick, delicious (it’s really good, even at room temperature) and surprisingly cheap! 13 Responses to Tonkatsu Bento, yet again. sarap! that’s looks really good. it looks really professional. parang tamang tama ang pagka-fry. naruto means swirl right? so does that mean that the pink swirl in the middle is more than decorative, since half of the name is dedicated to the swirl? did that make sense? hehe! That’s a really cute box I don’t think I have seen it before! Thanks for the tip on new bento boxes by the way. I saw this box and I thought it was really cute, but couldn’t get it because it’s green. Sadness! I wish they’ll come out with a new color soon. I did get the white bento box though, and the sandwich box. Oh yeah, I couldn’t get the bento bands either, because they’re green. Blah. Thanks. I have years of tonkatsu frying under my belt, but honestly there are still times when I burn it, hehe. And you’re right about Naruto being a swirl. I think Naruto, the anime character, was named such because he has a whirlpool on his belly button. Still, I think that the pink part is merely decorative and was named that just because it’s the distinguising feature. I loves it! And it only cost me 88PHP (less than 2USD) so I immediately grabbed and refused to let go, never mind that I have a gajillion boxes already. Regarding panko, how about trying with just a piece or two? Do you have panko at home? If you don’t, give me instructions and I’ll try it out for you, so you don’t have a bag of unused panko in case it turns out awful :P. Still, I remember Furikake Monster on bentolunch mentioning that she tried cooking korokke and tonkatsu in a toaster oven. Might be worth experimenting? Thanks! Do you have a break time? Maybe you could eat it then. Honestly, If I were the lecturer, I don’t think I’d appreciate anyone eating a full meal while I’m lecturing. 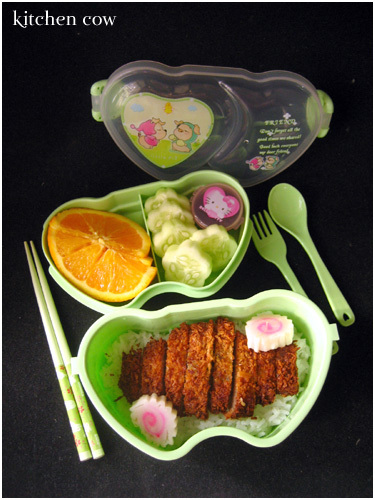 ^_^;; Or maybe you can try packing a snack box sort of bento: an onigiri, a few vegetable sticks—finger food mostly. I knew you loved blue but I didn’t know you hated green! Must be torture for you going here, with the orange and green theme, hehe. Now I’m wondering whether I should invite you to visit my doll blog since it’s green and pink! Haha well as long as it isn’t something I have to use or wear or actually own, I’m okay with it. 😉 And I do wear/use green stuff that people give to me as presents, because I appreciate their gesture even if I hate the color. I’m never going to buy anything green though, it’s just one of my quirks. Wait I’m too distracted, I don’t remember haha. Okay Kao I’m so sorry but I’m having a serious bout of amnesia at the moment. E-mail me! LOL. Hi! I enjoy reading your recipes! I just want to ask where you buy kamaboko? Or is it just plain fish balls? Thanks! Thanks SL! I’m glad you’re liking it. I buy my kamaboko from local Japanese groceries like Co-op and Hatchin. Sometimes though, even large local supermarkets have them, just look through the international refrigerated goods aisle. This particular kamaboko, naruto, is a bit different from plain Filipino fishballs in that it doesn’t have to be cooked. The roll is already steamed so you can just go and slice away. Personally though, I like either boiling or steaming it a bit—I guess I’m just used to cooking it.